A council member since 2019. Justin Maschhoff has been attending Abundant Life with his wife, Heide, and their three children (Josh-21, Bella-15, and Kaitlyn-12) for about 8 years. Bella and Kaitlyn both attend Orting Schools and Josh is beginning training in the field of Radiology. Heide is a physical fitness instructor at the Sumner YMCA and a coach at Vie Athletics on South Hill. Justin has worked for the Washington Department of Fish and Wildlife’s Enforcement Program for 14 years. He is currently a detective and investigates major crimes involving wildlife trafficking and commercial fishing violations. While much of his work these days has him tied to a desk, he also enjoys spending time outdoors. He enjoys hunting, fishing, hiking, snowshoeing, and backpacking. At ALCC, Justin is a member of the Pit Crew and enjoys attending Men’s Ministry functions. Heide and Justin have also volunteered to coordinate and oversee the Summerfest Fun Run for the past four years. Outside of ALCC, Justin served on the board of directors at The Haven - Orting’s teen center. During his three-year tenure, he served as a member, vice-president and president of the board. Justin was one of the founding board members when The Haven was started in 2014. 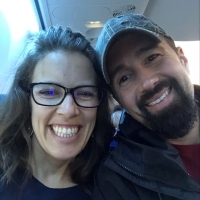 Prior to becoming a board member at the Haven, Justin and Heide were the area coordinators for YoungLife at Orting High School. In this position they put on weekly club meetings, mentored high school students, and spread the love of Christ to the youth of Orting. Some of Justin’s favorite memories include winter snowboarding camps, and taking kids to Malibu Club in Canada.